The setting is quintessential American heartland. I love the red barn, and even though they don’t appear in the painting, I can imagine what the house looks like, and what color the old pick up truck is that made the ruts in the dirt drive. The field of newly-sprouted crops against the rich purple-brown soil reminds me of the pattern in a favorite quilt. 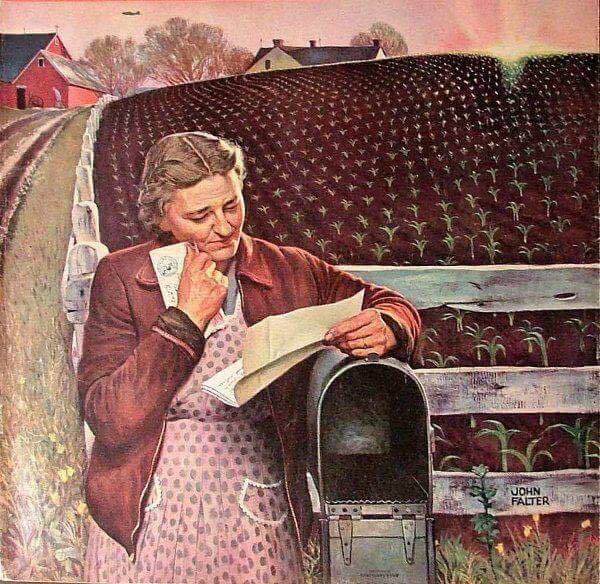 I can remember a time (long before emails, direct messages, and tweets) when I sometimes haunted our mailbox, waiting for a letter, so I understand what it was like for this woman to receive a long-awaited letter. I love that she couldn’t wait to get back to the house, but opened the letter and started reading, right there at the mailbox. There’s a small silhouette of an airplane in the top left corner of the painting; that, combined with the woman’s age and clothing, makes me think of all the mothers who kissed their sons good-bye when they went off to fight in World War II. That’s the story I imagine this painting is about: a mother anxiously waiting for news that her soldier son is healthy and unharmed. I love the sweet way she holds the envelope to her cheek. The way the sun tops the horizon just as the woman is reading the letter is a beautiful touch. I’m sure there are many other ways to interpret this painting: A mother waiting to hear from a daughter who moved to the big city; or a grandmother who hasn’t seen her grandchildren in a long time because they moved out of state. The possibilities are endless. But that’s the beauty of a really good picture or painting: It tells a different story to each person who views it. This painting is signed by an artist named “John Falter.” I Googled the name, but I couldn’t come up with a definite match. I’m going to keep looking, though; I’d love to see other pieces by this artist, and see what other stories he has to tell me through his brush. How about you? Have you ever come across a painting or photograph that really speaks to you or touches your heart? I’d love to hear about it! I freely admit I’m a hopeless romantic. There isn’t a romance novel trope I don’t like, from a hero in disguise to an orphaned heroine who must work as a governess to a moody widower aristocrat. One of my all-time favorite tropes is the friends-who-fall-in-love trope. In fact, I’ll go ahead and let the cat out of the bag: the book I’m writing right now is a variation on that theme. So it’s no wonder that a post on today’s Inspy Romance blog really touched my heart. It’s all about friends-who-fall-in-love, but it happened in real life! You can click on the image below to read the post. I hope you enjoy it as much as I did! This post is a little belated because I have been down for the count with the flu. I’m talking eleven days of laying on the couch, doing absolutely nothing but bolstering the stock prices of companies that manufacture facial tissues and cough drops. Today is the first day I’ve felt well enough to try to put words on my computer screen … which is oddly appropriate, given my blog topic today. You see, I write a lot on a typical day. I have a dedicated writing time when I sit down at my keyboard and give full reign to the stories and novels that live in my imagination. I write thousands of words on a weekly basis. Some of the stories I write are, in my opinion, pretty good. Some of the chapters in my novels are so-so compared to others. But regardless of the quality of the words I produce, I write every day. There’s just one problem . . . None of the stories and novels I’ve worked on are finished. It’s weird, because I know I can write a complete novel. I did it a little over four years ago when I typed “The End” on the last page of Ask Me Again. Ask Me Again was a contemporary Christian romance set in Colorado (my favorite place!). It was the first book I ever wrote. Several friends, family members, and ladies from church read it and gave me positive feedback; so I went for it. I self-published it on Amazon to see what kind of reception it would get. The book garnered five reviews; not a lot, but they’re all positive. I took those positive reviews as a good sign, and immediately started work on a new novel. A new novel I never finished. I can’t explain it. I don’t know why I started, but never finished, any any stories or novels since Ask Me Again was published. I don’t know why my brain gives up on writing as soon as a bit of dialog gets hard or a scene doesn’t work. It’s almost as if my usual determination flies out the window as soon as the story gets a little challenging. Instead of pushing through the difficulty, I find myself giving up, and turning my attention to a different story, hoping it will be easier to write, only to repeat the process again and again. In my heart and my head, I know there’s no magic way to write a book. Every plot will have its challenges. Every scene has the potential to go annoyingly off-track. But if I ever want to be truly satisfied with writing my stories, I know I have to complete them. In 2018 I vow to finish one of the many books or stories currently stored in the WIP folder on my computer. I vow to finish SOMETHING I started in my creative writing process. I vow to push through and write those extra words when my brain is telling me it’s just easier to give up and move on to another project. So that’s my goal for 2018. I have twelve months to get it done, and I think I can do it. I’ll keep you posted on my progress! I subscribe to about twenty blogs, not that many when you consider the millions of possibilities out there. But with a day job and writing the Isabella Alden blog and all the tasks associated with it, my time always seems to disappear each day before I run out of things to do. Hence my short list of blogs I make a point of reading. One blog I never miss is InspyRomance, published jointly by a group of contemporary Christian fiction writers. InspyRomance is where I get to know the people who write the books I most enjoy reading, and learn about their successes and new book releases. Last month Staci Stallings began a series of posts titled, In the Temple. I always enjoy Staci’s clear, straight-forward writing style; and in these posts, she didn’t disappoint me. In fact, she couldn’t have been more clear and straight-forward! Her Part II post last Monday about the meaning of “the Temple”—where Mary and Joseph found Jesus after the Passover feast—was a mini revelation to me. Have you ever read a blog post that made the light bulb go off in your head? That’s how I felt after reading Staci’s Part II post. Her message was a beautiful little nugget of truth that left me wondering how I’ve lived so many years not “getting” the point of the the New Testament story of Jesus in the Temple. I’ve re-read the posts every day this week as part of my morning prayers and devotions. They’re beautiful reminders to me of Christ’s true and constant presence in my life (whether I recognize it or not). I hope you’ll check out Staci’s posts and let me know if they have a ring of truth for you, too. 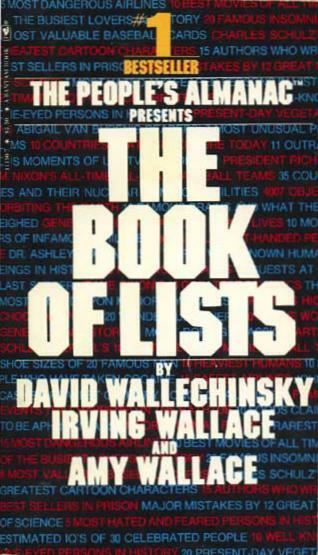 Many years ago I read The Book of Lists by David Wallechinsky, Irving Wallace, and Amy D. Wallace. It was a best-seller that captivated me and millions of other readers. As the title suggests, it was a compilation of weird facts and fascinating trivia that was downright addictive (I also read the sequels, The Book of Lists 2 and The Book of Lists 3). Something in those books clicked with me and I became a creator of lists. Many years later, I still use lists to organize my day, keep track of family members’ birthdays and anniversaries, and remind myself of seasonal tasks around the house. 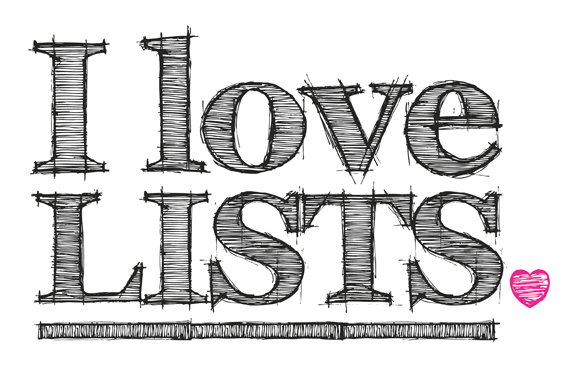 I list books I want to read, books I have read, movies recorded on my DVR, and items to add to my next Amazon Prime order. Why am I a lister? Because it’s immediately rewarding. There’s a certain amount of gratification I get when I cross an entry off my list. It’s empowering and no matter what else happens that day, I know I had at least one triumph. I accomplished something. I can point to my success. It’s there in black and white on the page: a bunch of letters symbolizing a need, want or requirement, with a big old black line running through it. I’m a winner. But there can be a downside, too. 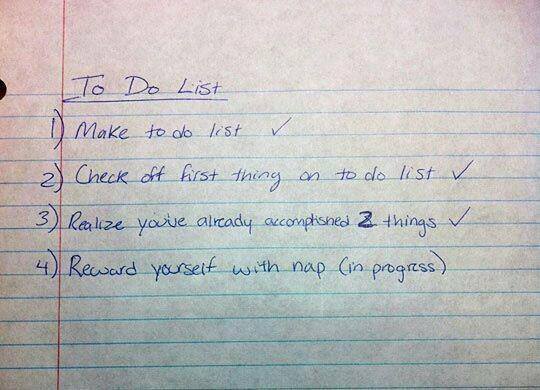 If I reach the end of my day and have to carry a task over from one day to another, I feel a little bit of pressure. Did I not manage my time well? Was I over-confident in my abilities to get everything done? Was that hour I spent playing Candy Crush (which I justified with an “I deserve it because I’ve been working so hard”) a mistake? 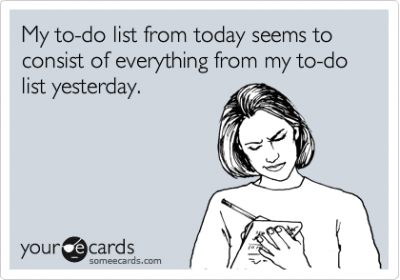 The truth is, I don’t have to perform some deep analysis to know why I didn’t get through every task on my list; in my heart (and head) I already know I wasn’t as focused and efficient as I could have been. And If I’m really serious about achieving the goals I set for myself in all my many lists, I know I have to get on track and stay there. I know I have to make coffee in my own kitchen instead of jumping in the car and heading to Starbucks. I know I have to fight through those human urges to procrastinate and keep focused on what it is I’m trying to achieve. 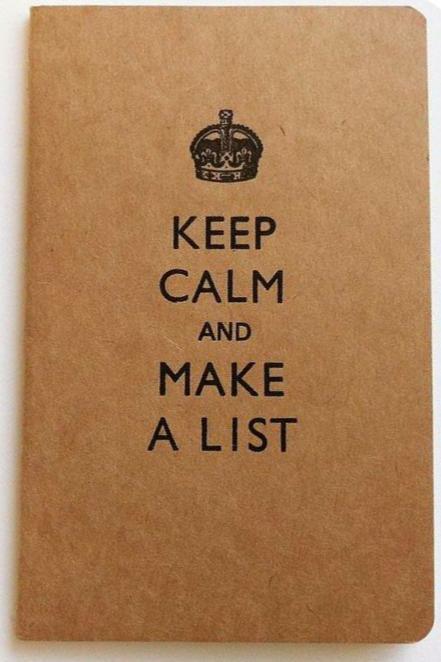 In the end, my lists help me remember my dreams and how I’m going to achieve them. And since I never run out of dreams, it’s a sure bet that I’ll never run out of lists. How about you? Are you a lister? What methods or tools do you use to stay on track every day with life’s big and little things? 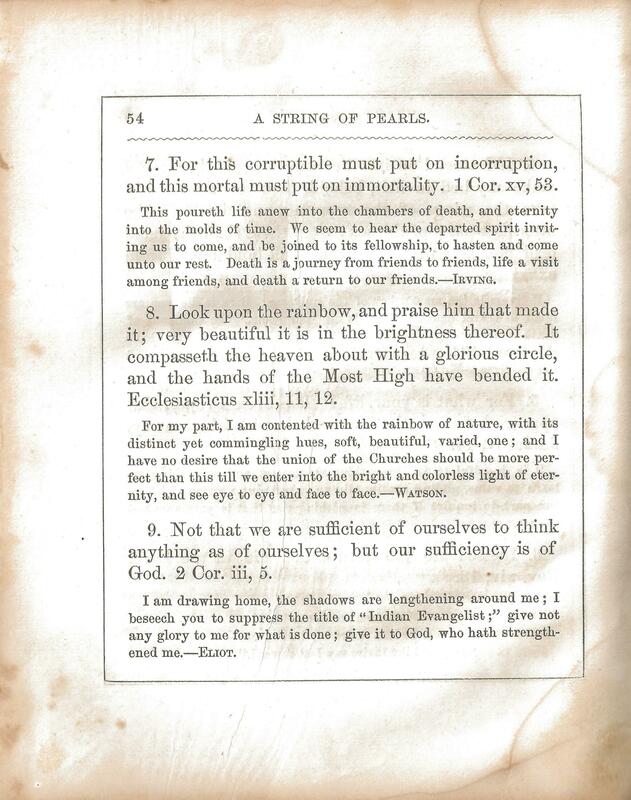 I immediately had a visual image of God’s commandments and teachings as pearls strung together so we can wear them wherever we go throughout our day. I thought this book was so charming, I used it as inspiration for a fictional book in my novel Ask Me Again. 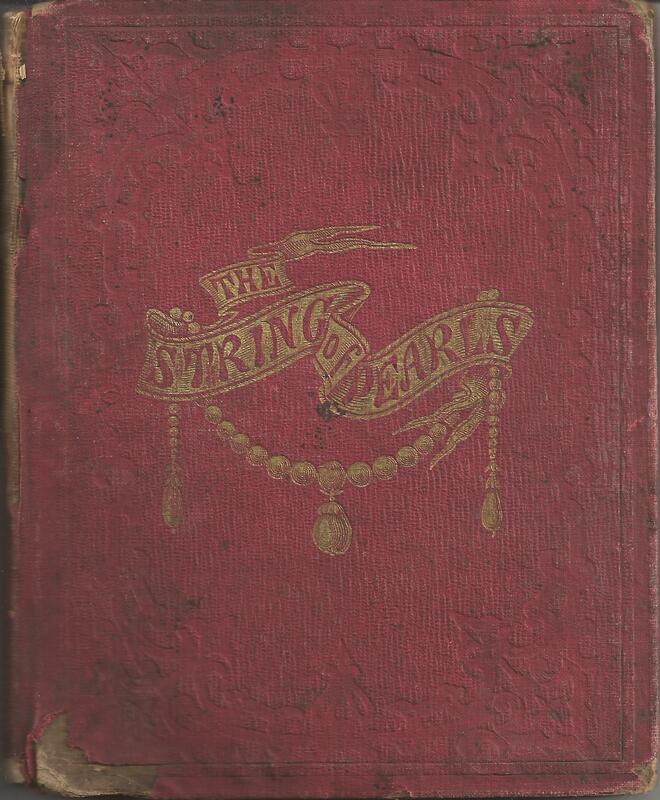 The heroine, Minda McAllister, has a book called Mrs. Plowright’s 1908 Guide for the Genteel Lady Gardener, which Minda describes as “a peculiar mixture of gardening tips, etiquette lessons and Christian affirmations”—much like String of Pearls.